There being more of them is probably good for normalizing this kind of thing. Exactly, that’s a faulty train of thought, that’s like saying you’ve seen one toddler able to swim, and thinking that all of them can. I think an infection would be temporary, so he’s basically saying “no they always look like that”. So I guess the fact that one is purple and the other’s green completely escaped Rory? Nah. That’s just building up a precarious web of lies. What you do, at this point (though they don’t know it’s gotten there yet, so can’t interject) is just tell the truth-ish. It’s so out-there that they’ll be like, “What? Yeah, real funny, haha” and brush it off. As long as you play it off cool, they’d rather take the illness explaination. Granted, the Govment might not appreciate you spilling secrets like that, but without an agent right there to provide informational backup and intimidating spook-ness, baffflement is the best option. They wanted a way to integrate the two races eventually, right? How long were they predicting it would take before the secret got out? Did you hear that? They’re everywhere! It’s NOT that bad. I mean it would be far worst if they were teenagers, right? The acned apocalypse is nigh! Can you two wieners chill for a second? You make it seem like they threatened you or something. I don’t think they think they’ve been threatened. I think they’re just trying to make sense of a very confusing situation. is that a “this dude blew my mind” or “this dude is nuts” face? There is one thing I’ve been thinking about the pace of this cartoon strip. Selkie and her sister are more or less getting along. They talk, they are playing now. All the kids from the orphanage know she’s not human. No panic on the part of the kids. One might think adults would be the same. Yet the government is keeping the secret of the merpeople a secret. Relate this to real life: Does an yone wonder what the government keeps secrets about – FOR OUR OWN GOOD? It’s been alluded to that all that secrecy is in a big part due to resonance (their green magic stuff). Oh. What you made me wonder is, In real life, so… what are the secrets that all the kids take for granted, that we adults are blind to? 1) Fast Integration VS Slow Integration. Since the integration process is slow and steady with controlled and monitored Sarothi living with humans, by the time that ignorant and fearful humans DO realize what’s going on, each and every government approved Saronthi will have real and stable bonds with human allies. In other words, the friendly humans will willingly defend the Saronthi from the hostile humans because the friendly humans and Saronthi have real bonds with each other. Right now, if anyone tries to mess with Selkie, Todd, Amanda, Andi, Lillian, Agent Brown, and countless other people will rush to Selkie’s side. Not because she’s a Saronthi, but because she’s a person- a person -they all care about. And that’s how it should be. Now think about what would happen if hundreds of Saronthi suddenly appeared from Lake Superior saying “Hello Humans, we come in peace! Mind if we talk to your leaders about some issues we have that we need your help with?” Doesn’t matter that it’s true, doesn’t matter that they did it as gracefully as they possibly could, EVERYONE would be looking at them cross-eyed. Even humans that would gladly support the possibility of friendly sentient non-human life would be shut down by widespread panic and public fear of the Saronthi “suddenly” appearing on “our” planet. The ignorant and the fearful would be in control, and every interaction would be damage control to stop stereotypes from both sides from killing each other. Technically, humans and Saronthi already met. Humans screwed up. And we already know from Glen that there are some Saronthi who wouldn’t mind an “alien invasion” with the powers of the Echos and resonance despite other Saronthi not wishing anything of the sort. Doesn’t matter if the majority of Saronthi are peaceful if you have a few radicals speaking for you that you never wanted. All it takes is one evil “alien” with superpowers to paint all of them in a bad light. And eventually, one genuinely bad Saronthi will get in the public eye sooner or later. The ultimate goal is for not if, but WHEN that happens, that humans won’t say “I knew it! We never should have trusted Saronthi!” but instead say “I knew it! We never should have trusted Glen!” And for that to happen we need lots and lots and LOTS of “Selkies” out there to prevent that stereotype from ever forming just because of one bad example of their species. This is why the government is keeping the Saronthi under wraps. Because what they’re doing now is the only possible way that both species can learn to get along before idiots on either side eventually start trying to kill each other. Sorry for the long post, but this hit home for me. I know this is fiction, but this right here is why race relations are such a big deal, and so complicated. Soul, this is an amazing comment! Just getting my thoughts out. Thank you. That’s what I was thinking, too. Unless blond-employee is thinking that “fungus” is the explanation for the entire appearance rather than just for the eye-glow. Yeah that does seem weird. :l But these two are dorks. Hopefully they won’t do anything silly. No, I think most normal adults would have enough common sense to know it’s not a fungus. That’s not how fungal infections work. I’ve had one, I wish they glowed green. 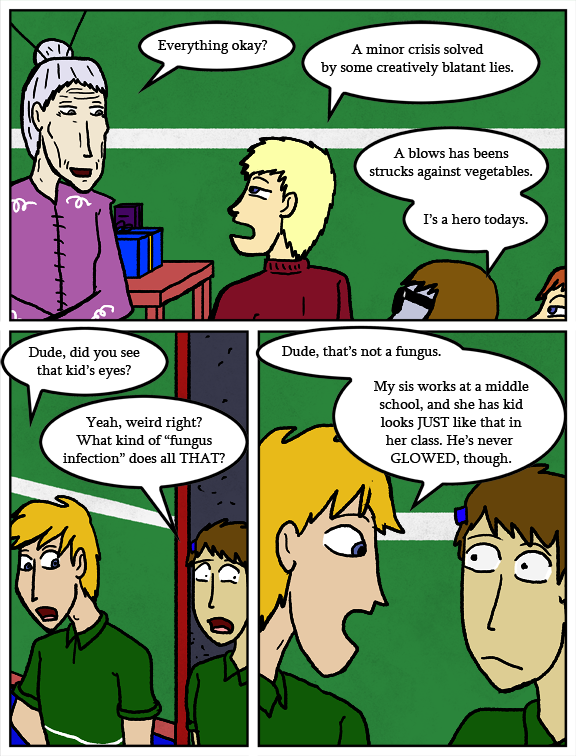 Aside from that, I’m not aware of any fungus that glows that brightly in the middle of the day or a well lit building. At least If it were at night or in a dark room, it’d make more sense. I wonder how long it’ll take before people start realizing that the folks with a “genetic disorder” are seen primarily in areas near a specific Great Lake, and jump to the conclusion that it’s due to a toxic spill or some other pollutant there.